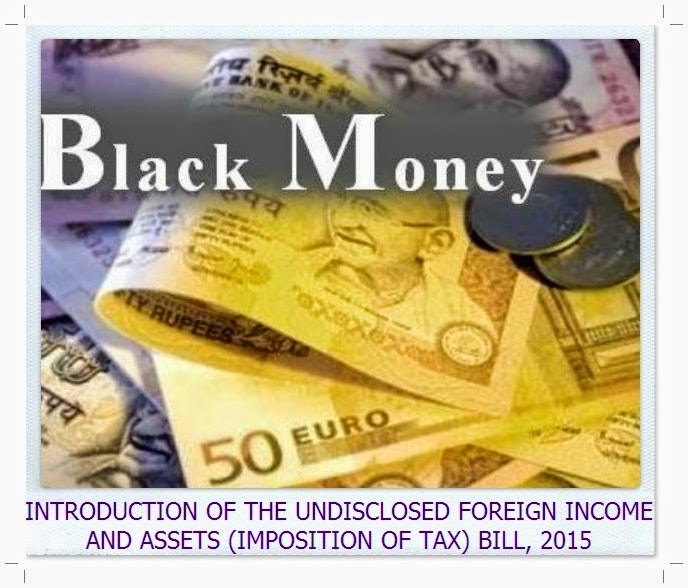 In order to fulfil the commitment made by the Government to the people of India through the Parliament, the Undisclosed Foreign Income and Assets (Imposition of Tax) Bill, 2015 has been introduced in the Parliament on 20.03.2015. The Bill provides for separate taxation of any undisclosed income in relation to foreign income and assets. Such income will henceforth not be taxed under the Income-tax Act but under the stringent provisions of the proposed new legislation. Scope- The Act will apply to all persons resident in India. Provisions of the Act will apply to both undisclosed foreign income and assets (including financial interest in any entity). Rate of tax - Undisclosed foreign income or assets shall be taxed at the flat rate of 30 percent. No exemption or deduction or set off of any carried forward losses which may be admissible under the existing Income-tax Act, 1961, shall be allowed. Penalties - Violation of the provisions of the proposed new legislation will entail stringent penalties. The penalty for non-disclosure of income or an asset located outside India will be equal to three times the amount of tax payable thereon, i.e., 90 percent of the undisclosed income or the value of the undisclosed asset. This is in addition to tax payable at 30%. Failure to furnish return in respect of foreign income or assets shall attract a penalty of Rs.10 lakh. The same amount of penalty is prescribed for cases where although the assessee has filed a return of income, but he has not disclosed the foreign income and asset or has furnished inaccurate particulars of the same. Prosecutions - The Bill proposes enhanced punishment for various types of violations. The punishment for willful attempt to evade tax in relation to a foreign income or an asset located outside India will be rigorous imprisonment from three years to ten years. In addition, it will also entail a fine. Failure to furnish a return in respect of foreign assets and bank accounts or income will be punishable with rigorous imprisonment for a term of six months to seven years. The same term of punishment is prescribed for cases where although the assessee has filed a return of income, but has not disclosed the foreign asset or has furnished inaccurate particulars of the same. Abetment or inducement of another person to make a false return or a false account or statement or declaration under the Act will be punishable with rigorous imprisonment from six months to seven years. This provision will also apply to banks and financial institutions aiding in concealment of foreign income or assets of resident Indians or falsification of documents. Safeguards – The principles of natural justice and due process of law have been embedded in the Act by laying down the requirement of mandatory issue of notices to the person against whom proceedings are being initiated, grant of opportunity of being heard, necessity of taking the evidence produced by him into account, recording of reasons, passing of orders in writing, limitation of time for various actions of the tax authority, etc. Further, the right of appeal has been protected by providing for appeals to the Income-tax Appellate Tribunal, and to the jurisdictional High Court and the Supreme Court on substantial questions of law. To protect persons holding foreign accounts with minor balances which may not have been reported out of oversight or ignorance, it has been provided that failure to report bank accounts with a maximum balance of upto Rs.5 lakh at any time during the year will not entail penalty or prosecution. Other safeguards and internal control mechanisms will be prescribed in the Rules. One time compliance opportunity – The Bill also provides a one time compliance opportunity for a limited period to persons who have any undisclosed foreign assets which have hitherto not been disclosed for the purposes of Income-tax. Such persons may file a declaration before the specified tax authority within a specified period, followed by payment of tax at the rate of 30 percent and an equal amount by way of penalty. Such persons will not be prosecuted under the stringent provisions of the new Act. It is to be noted that this is not an amnesty scheme as no immunity from penalty is being offered. It is merely an opportunity for persons to come clean and become compliant before the stringent provisions of the new Act come into force. Amendment of PMLA – The Bill also proposes to amend Prevention of Money Laundering Act (PMLA), 2002 to include offence of tax evasion under the proposed legislation as a scheduled offence under PMLA. Thus, in keeping with the commitment of the government for focussed action on black money front, an unprecedented and multi‐pronged attack has been launched to root out the menace of black money. The Government is confident that this new law will act as a strong deterrent and curb the menace of black money stashed abroad by Indians.